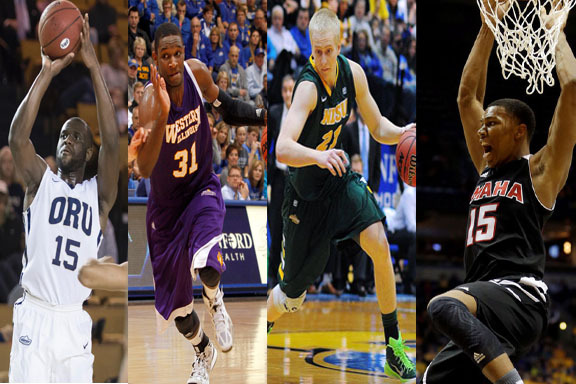 The Summit League preseason team came out last week, and it was pretty fair. It is actually really difficult to come up with a 1st and 2nd Team list of picks, especially in a guard heavy league and you are a fan that wants to see the first team be a traditional line up with 2 post players, a wing player, and 2 guards. I was listening to the recordings from the Summit League Media Day yesterday and was happy that Scott Nagy basically called preseason teams pointless. Last year no one predicted that his players Deondre Parks and George Marshall would be all league picks, and it is basically because no one knows how the newcomers are going to do at this point. Or if someone like Tyler Larson is going to see a huge improvement in play. IUPUI’s transfers Nick Osborne and Darell Combs could be better than AJ Jacobson and Garett Covington for all we know. Or IPFWs redshirt freshman John Konchar could be a better player than Jake Bittle. We have to wait and find out. Preseason picks are basically made to make us even more excited for the college basketball season. So I wanted to do something (that I thought) that would be fun and create a Summit League Super Team… This was nothing more than merely fun and to verify my lunacy…maybe to show how much time I have on my hands with my wife busy studying and working toward her PhD. Imagine there is a tournament with the best players from each conference each year at the end of every season. There can be a power conference tournament and a mid-major tournament if you are really scared about this, but it is make believe, so get over it. So, each conference has to put together a 12 man roster of their best players from the conference, and you can have three players that can be reserves in case any of the 12 get injured. They can be in any year of eligibility, but they must have been eligible in the 2015-2016 season in this case. One wrinkle in the roster is that you have to have at least one player from each team on the 15 man roster. So let’s pick someone from each team. Okay…okay…the first thing I think when I look at this finished roster is that the team is small. We are going to need some height on this roster to compete against the other conferences. We cannot reasonably take this team to a tournament like this with Barksdale, Burnette, and Jacobson as our post game. How about we throw in candidates to fill out the roster. So we have to pick six out of these twenty guys, which is not easy. How about we address the post player void first and pick three post players from the list. Am I too bias to throw in Jake White and Tre’Shawn Thurman right off the bat? Are Byrd or Kading better players than either of them? The jury is out on Byrd since he plays in such a slow paced offense. Kading apparently had 3 surgeries since the basketball season ended. Osborne has yet to play a game in the Summit, and we are just going off of the He Played Alright in a Slightly Bigger Conference So He Has to be Pretty Good With a Year Off and Now Into a Smaller Conference card. I like Reed though, he’s going to go from being the ‘Dons 5th option to being their 2nd or 3rd option. He can step back and hit the three, even though he is not going to do it a lot. He also played very well when Steve Forbes was hurt for a few games. Okay, we are adding Reed and Thurman for sure. So White or Kading…I know Kading did not score a bunch of points in 2014-2015, but he did not need to. He led the Summit League in blocks per game season, and this team needs rim protection. With Thurman and Burnette on the team, the team will have to the two leading returning rebounders in the Summit League, so we are somewhat covered there. I think I got to take Kading on this one. But crap, what about Dexter Werner? He was probably actually the most important member of the Bison last season not named Alexander or Jacobson. You look at Werner and you think he is just going to get rebounds and put backs, but that is not true. He gets the ball at the top of the lane and drives it to the basket when he wants. He also has some pretty spectacular spin moves that put a number of Summit League guards to shame. I know he is undersized, but I think we have to go Werner, especially considering the injuries to Kading and White. So we have Werner, Thurman, and Reed on the roster. We are up to twelve. This team has two very good point guards in Devin Patterson and Mo Evans, but they both can be a little fast. We might need a guy to say “SLOW DOWN!! !” The guy for that is Jake Bittle. It is not like Bittle is slow, but if you ever watch a Jackrabbits game, Bittle is the man to run the half court offense. He holds the ball at the top of the key and then Parks and Marshall work to get open. He is the quarterback and they are the wide receivers. I feel like we are one post player away. I know I had Kading and White as the leading candidates before, but I want to go with IUPUI’s Nick Osborne on this one. He is a transfer, sure, but there are high expectations around him for the Jags. Maybe not as much as Cody Larson had when he transferred to South Dakota State from Florida, but there are high expectations for him. I am not sure if he is going to be a great player in the Summit League, or better than White or Kading, but damn it I want to take the gamble here. So this team has some rebounding and rim protection, ball handling and passing, three point shooting, and perimeter defense. I think we might have to go with George Marshall here. He is probably not the most important player on his team, but he is highly needed on what should be the best team in the Summit League in 2015-2016. I don’t know how this team would do in a tournament like this, because I already wasted enough time make this, so it is not like I’m going to go waste even more by making an Super WAC Team. It is probably not even the top 15 guys in the conference, but it would be an extremely competitive team. Expect this to get incredibly annoying. ex: Dan with the ReJechtion! ex: Tyler takes no Flack! ex: Deondre Parks himself on the bench.